CAN CROSS TRAINING HELP WITH SWIMMING? New research shows that resistance training has a dramatic impact on swimming performance. More specifically, resistance training that consists of low repetitions at a high velocity and force help swimmers achieve optimum stroke length. According to the study, this relationship exists because the propulsive forces that facilitate swimming are mainly produced by the upper body. Furthermore, as upper body strength increases so does sprint performance, and the same type of resistance training that builds the strength of the upper body is also transferred to swimming performance. This means that it is important to make sure your body is in top shape before you begin to swim regularly. Although research has demonstrated a link between upper body strength and swimming performance, swimming is a full body sport. Therefore, it is also essential to engage in exercises that strengthen the core (i.e. abdomen, hips, pelvis, and lower back) and leg muscles. The ideal exercise regimen should incorporate a combination of arms-only training, respiratory muscle exercises, leg-kick training, strength or resistance training, and assisted sprint swimming. For example, strength and endurance training on dry land that entails three sets of pull-downs in which one to five maximum repetitions are performed, have been shown to boost swimming stroke and force. Sprint swimming resistance training that involves having a fixed push off point also helps increase maximal power output for swimmers. Exercises that specifically improve shoulder strength include the overhead press and rowing. 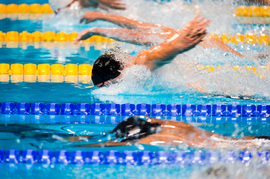 Starting a vigorous swimming routine without properly training beforehand may lead to unnecessary joint and muscle pain, overuse tendinopathy, or other shoulder soreness that could actually disrupt your swimming stroke as well as your training regimen. If your muscles are weak or significantly imbalanced, an even more serious injury such as a rotator cuff tear or shoulder dislocation could prevent you from swimming for an extended period of time. If you are suffering from a previous or current swimming-related injury or any other injury, you may benefit from working with a Physical Therapist. More specifically, a Physical Therapist can show you how to properly perform stretching routines, strength building exercises, and conditioning techniques that target the muscle and tendons in the joints. The Physical Therapists at Emery Physical Therapy conduct thorough assessments in order to determine exactly what type of Physical Therapy regimen will promote healing and prevent future injuries. In order to experience optimal swimming performance, you need to have a full range of motion as well as strong upper body, core, and leg muscles. Pain and discomfort in any of these regions can make it hard for you to swim with maximal power and muscle weakness increases the risk of injury. Our team of experts at Emery Physical Therapy can evaluate your current level of physical fitness, body alignment, and muscle strength in order to focus on improving specific aspects of your training routine that will ensure you enjoy the health benefits of swimming regularly without experiencing unnecessary injuries. Call Emery Physical Therapy at 847-786-2014 to learn more about how our services can greatly benefit you.